Google Play recently published its lists of the Best Games of 2015. Junior Three Kingdoms, GTArcade’s flagship mobile game in Asia that combines high quality and strategic gameplay, is honored as Google Play 2015 Best Games in Hong Kong and Taiwan, alongside others like Clash of Clans and Hearthstone. As GTArcade’s first Mobile game released in early 2015, Junior Three Kingdoms quickly ascended to the Top 3 on Grossing Charts and kept its leading position for the following 9 months. Only 20 days after its open beta test, the game generated a remarkable revenue of 100 million RMB. The success continued as monthly revenue surpassed 160 million RMB at peak and overall revenue totals over 900 million RMB. These records have redefined the success of a Three Kingdoms themed card game in the mobile market. Since its release in Taiwan in June, both on the App Store and Google Play, Junior Three Kingdoms has delivered the perfect action strategy RPG experience that’s been a hit with gamers thanks to its stereoscopic and dynamic card game style, deep gameplay, and colorful visuals. 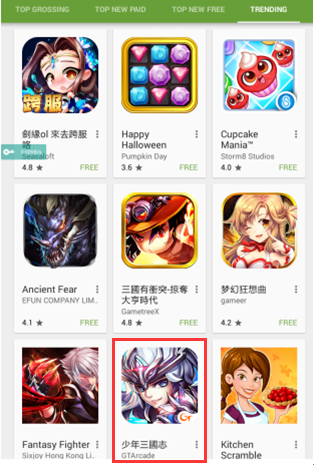 Three days after its release, Junior Three Kingdoms reached the Top 3 games in both the App Store and Google Play Grossing Chart, and has remained in the top 10 since then. The game was also featured by Google and Yahoo several times. On December 1st, a Traditional Chinese version was released in Singapore and Malaysia, enlarging its publishing realm. After achieveing tremendous success in mainland China and Taiwan, Junior Three Kingdoms is now targeting the Korean Market, where the gamers are more similar to Chinese gamers. The game is expected to hit the Korean market in the first quarter of 2016. We have strong reason to believe that GTArcade will bring more competitive games to the global market in the near future.